Police are seeking the person or people who set fire to this Donald Trump campaign sign. 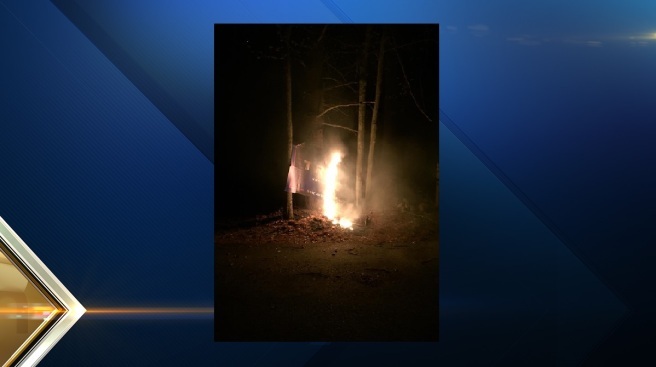 Police in Hollis, New Hampshire, are seeking the public's help in identifying the vandal or vandals who set fire to a campaign sign for presumptive Republican presidential nominee Donald Trump. Hollis Police said a campaign sign at 261 South Merrimack Rd. was set on fire around 12:45 a.m. Monday. Upon arrival, police found the large campaign sign hanging between two trees, fully engulfed in flames. A police officer was able to extinguish the fire. The owners of the sign said this isn't the first time the sign has been damaged. Anyone with information on the suspect's identity is asked to call Hollis Police at 603-465-7637.